Tom Knapp, billed as the Shooting Star, has been educating and entertaining sports enthusiasts around the world for some twenty-five years by now, bring along is unique blend of shooting skills, showmanship, and entertainment to audiences in eighteen or so countries. Tom breaks things. He crushes clays, he makes salad with his shotguns, he shoots around corners, he decimates billiard chalk, he atomizes aspirin. Just about everything Tom touches or looks at breaks in spectacular fashion. If I was Tom, I'd be afraid to go to the bathroom. Tom follows in the rich tradition of exhibition shooters. I suppose you could call him a professional exhibitionist, but might attract the wrong crowd. Whether the legend of Annie Oakley, the Fabulous Topperweins (Ad and Plinky), or the young boy so inspired by the Topperweins he followed to become a tremendous talent of his own, Herb Parsons. Years ago, I remember going to see billiards great Willie Mosconi do his thing for Jackie Gleason pool tables. It is this type of mesmerizing, respectful, and good-humored presentation that Tom Knapp brings to his audiences. Tom has been known to use billiard chalk as well, but in a bit more spectacular fashion than Mr. Mosconi. Tom Knapp educates, stressing safety and responsibility, but always gives a show that invariably delights his audiences and leaves them wanting more. Tom Knapp is a class act, offering that rare blend of excitement, intrigue, humor, and inspiration. 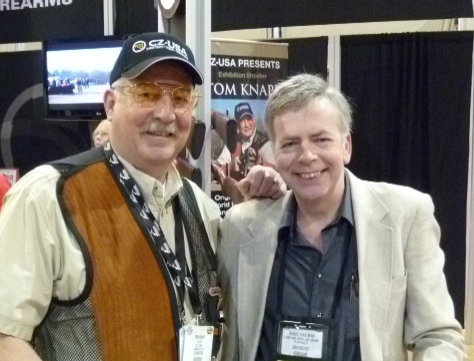 As a result, Tom Knapp has become renowned world-wide as the greatest, most respected proponent of shooting sports of the modern day. With that, it is time to welcome along Mr. Knapp to find out what he's currently up to and what his future projects entail. Randy: Tom, my father just turned eighty-three and he loves it when the kids like you turn out to do so well. When and how did you develop your routines, and how have they changed over the years? Tom: I was nine years of age (1959) when I saw Herb Parsons only film, The Showman Shooter on the original TV show Wide  Wide World. Then again on the new TV show, Wide World of Sports in 1960. The images, routines, and the thoughts of a man making a living with a hobby were etched in my mind and became an obsession throughout my early man-hood. Randy: With all of the traveling you've done, do you have any favorites? The people, places, and events that are most memorable to you? Tom: I enjoyed much of Europe as I was introduced to the many cultures and life-styles. I was most familiar with Scandinavia because the 5 State region surrounding my home State of Minnesota contains many Scandinavians. I was most comfortable there, especially after being on World Tour for months away from home. Randy: It looks like you have a diverse schedule this year. You've been a fixture at the Anoka Game Fair in Minnesota, but it looks like you have California, Maryland, Missouri, and even Ashmore, Illinois appearances already booked. Is the best way to find out about your appearances to check the Appearances calendar on your website, http://www.tomknapp.net ? Tom: Glad you brought up the Anoka Game Fair. Many people think I was the fixture there when in fact, it was John Satterwhite. During the same two decades, I was the fixture at Game Fair Italia (and other European Game Fairs. I appeared 1st time at the Anoka (Minnesota) Game Fair for only one Weekend (they are a two weekend fair) in 2008. I then appeared there for both weekends in 2010. I am scheduled to be there for both weekends this year (2011) as well. My Appearances page is updated and accurate and yes, thats the best place to find out where Ill be shooting. Also, my Web site is being (slowly) updated and my Online Store has many new products that offer shooters and hunters a wider variety of accessories that can help them be better and more consistent with their shooting endeavors. Randy: Tom, you've been active doing your hunting sessions in Argentina of late. How many of these are you planning a year, and what can you tell us about the experience? Tom: I created my Tom Knapp Show & Tell in Cordoba, Argentina as a way for me to continue working, but make it feel like a vacation. The High Volume Dove shoots they offer provide a perfect scenario for lending advice to shooters without it seeming like a pressured Instructional Seminar The outfitter (SYC Sporting Adventures) offer a very economical package for two groups of 12 hunters. I host both groups from the time they arrive to the time they depart. Its an all inclusive package and the only thing each hunter pays above the package is the extra ammo (the first 1000 rounds is in the package). Many of the shooters will shoot 500 shots per hunt and there are 6 hunts. I will provide suggestions if asked, and if the shooter is hitting, I move to the next hunter. I will perform one live show during the groups stay and one Live Bird exhibition as well. Please keep in mind, the countless doves there are regarded as pests and will consume over 30% of the farmers crop yield. Many of the doves are prepared for our meals and much of them are transported daily, to local public establishments for consumption. I will be holding my next Tom Knapp Show & Tell this coming February 12  15 and 16  19, 2012. Look for other offers at www.sycsporting.com . Randy: I'm advised that with the Nordic extension tube on your CZ 712s, you are limited to just eleven shots. Is that enough? Do you use that shotgun for anything else? It seems like if you wanted to hunt pheasants in Illinois, you might have to use a pool cue as a magazine plug. Tom: The magazine extensions I use are for the sole purpose of exhibition shooting. There are many states that have no restrictions on ammo capacity for upland and certain types of waterfowl (spring snow geese). I know from experience that one can collect their limit of game or fowl with the normal 3, 4, or 5 shots that most repeaters offer out of the box. Besides, extra shells in your pocket are heavy enough let-a-lone hanging under an 7 pound gun! Randy: Since you do your fair share of hunting, do you have any opinion on chokes and payload? Do you see a lot of hunters and shooters that are under or over-choked, or just don't bother to pattern at all? 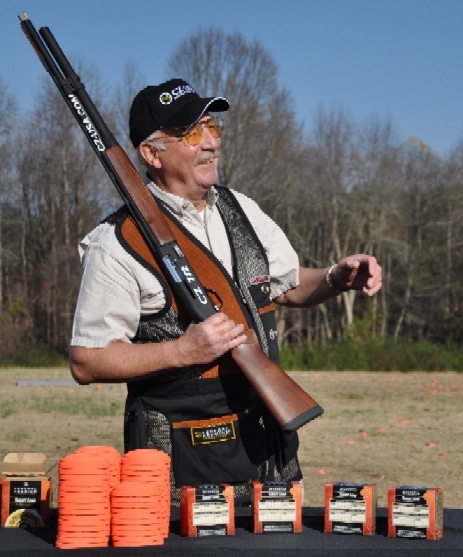 Tom: Im of the opinion that most hunters seldom pattern their shotguns at all. I have found great recipes for many hunting circumstances by just reading the offerings from the ammo manufactures Web sites. I met Scott Carlson of Carlsons Choke Tubes and learned a lot on how certain chokes can make a difference with certain internal cartridge components too. Example; early season (South Dakota) wild pheasants Vs Late Season. I use the same cartridge (Federals 2 ¾ - 1 ¼ oz #4 Pheasants Forever Load) for both, but in early season, Ill be using Carlsons Extended IC. It has a longer parallel section than a standard IC and forms better pellet alignment before departure from the muzzle. Later when the birds have had enough pressure, Ill simply change to a Carlsons Extended IM. This lends a tighter pattern and one need to shoot more precisely. Straight-aways are not as critical as long crossers because of the forward lead (that many, including me) will not calculate far enough in front, but the tighter choke will provide the necessary pellet count on target when the correct sight picture is applied. Randy: Folks seem to have their own ideas about volume shooting, thinking that 1000 rounds in an hour isn't possible. What's your personal record, with a shotgun, for aimed shots fired in one hour? Tom: I was recorded while on a dove shoot with my outfitter SYC Sporting outside of their lodge of El Cortijo (Cordoba, Argentina) as I joined their 1000 club by firing 2020 cartridges, killing 1506 doves within 1 hour, 45 minutes. Of course arm fatigue and other factors will take their toll and how long one could keep their consistency or average would depend on their physical condition. Randy: What was the story behind shooting around corners with a rifle, how did this come about? Tom: Youre referring to the shooting gallery routines we set up for the History Channels documentaries. Many of the extraordinary shots that have been dreamed up for TV shows of this nature are taken from some of the historic events from the past and some are taken from Disneys Cartoons. They are all based on the Law of Physics. If the Law of Physics says it could happen, I like to try. All experiments should adhere to maximum safety standards and beyond. Randy: Sometimes, the show must go on. My understanding is that you've done your complete show with frozen fingers and all kinds of somewhat unexpected challenges. What are some of the more challenging conditions you've performed under? Tom: When your job changes from a passion to an obsession, you realize no boundaries. Also, to know your audience has gathered from expectations delivered by advertising and many of them are there because of their desire to see YOU, its very difficult to cancel. I have done live shows in Abilene, TX with flu-like symptoms and a 103 degree body temp.. I have done a live show on December 16 near Québec, Canada with air temps at minus 26 with a 15 mph breeze. The discomfort goes away after the show is done and you realize the public enjoyed it. Randy: You performed for groups topping eight thousand or so audience members. How do you change things up for more intimate or larger crowds? Tom: Large audiences (over 2000) are problematic because of the distance between myself and the spectators. Some of my largest audiences have been performed at a race track or large arenas when the seating arrangements allowed some form of organization. I nearly encountered riot conditions when I was asked to perform on an abandoned air strip in North Spain. It was flat ground and was advertised as Free To The Public for a National Hunters Holiday. More than 14000 spectators showed up and because of the lay-out, only 1000 could get close enough to see anything. 400 of those were kids sitting on the shoulders of their parents! Thanks Randy! I look forward to seeing you down the trail. Please tell your readers they can e-mail me and Ill do my best to reply. For the latest news and updates from Tom, be sure to stay tuned to http://tomknapp.net .